We track the supply of homes for sale in Tallahassee two different manners. First, we track the total number of houses that are on the market (the real supply), then we calculate the months of supply of homes based upon the current rate of demand (relative supply). By tracking both the real as well as the relative supply of homes for sale, we can get a feel for the health of the Tallahassee real estate market. 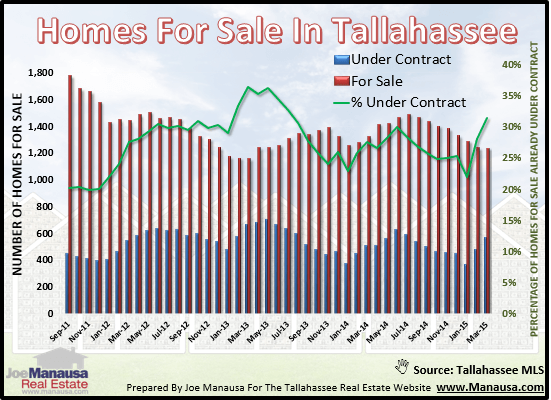 Currently, the months of supply of homes means Tallahassee remains in a "buyer's market," but November brought another month of improvement. The relative supply of homes fell again in December, with the current inventory of houses measuring at 6.7 months of supply. While this is not even applied across all price ranges, we can continue to report that overall the housing market still slightly favors buyers. In the real estate graph above, the real supply of homes is shown each month along the red line and measured on the right vertical axis. The number of homes that sold each month are shown in green (and also measured on the right vertical axis). The resulting relative supply is shown in blue and measured on the left vertical axis. The market is considered at equilibrium (balanced) at 6 months of supply, and we have been moving closer to that each year since 2007. When we examine the properties that are on the market in Tallahassee, we find the normal seasonal decline in the total number of houses for sale. But when we examine the real availability of these homes, we find that there are actually a few more homes on the market now than there were at this same time last year. 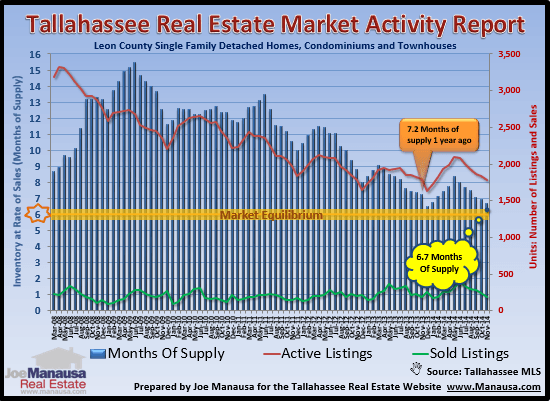 The graph above breaks down all the homes for sale in the Tallahassee real estate market by their listing status. Homes that are already under contract are measured in blue, while homes that do not already have a commitment made to a buyer are shown in red. The green line shows the percentage of homes that are under contract at any given time. One point that is interesting on this graph is the rise in the green line in 2012 when short sales become common. This brought about a lot of houses that were "on the market" but already spoken for. Sometimes, a short sale would sit in this encumbered status for several years. As we wind our way out of the distressed properties (currently, 26% of the homes on the market are distressed), we are going to see the number of homes under contract drop below 20%. This means that when buyers are shopping, they will have more real options, even without the inventory of homes for sale rising above current levels. The following list of homes are ten of the most recent listings in the Tallahassee MLS. You can click on any one for more information on a specific property or click through to search all of the listings. I hope our report on the months of supply of homes for sale in Tallahassee has better prepared you for your next real estate transaction. Please drop me a note if you have more questions or a need in the Tallahassee real estate market.